Grate them and add to all sorts of things – quiche, meatloaf, sausage rolls as well as cakes and muffins. I don’t bother peeling the vegetables before grating them, however if I am using a ginormous zucchini (marrow), I cut them in half and scrape out the seeds. These are donated to the compost bin. The grated flesh is then used just as you would grated zucchini. It is a great way to dispose of marrows. This year I have grated and dehydrated grated zucchini in two cup portions. The idea is to rehydrate them whenever I need to bake or cook with zucchini. I have also frozen about 10 lots of 2 cup portions to keep us going throughout the year. The frozen idea came first then I read about dehydrating zucchini here and away I went. I have had many suggestions on stuffing marrows with a minced beef mixture however APML turn their noses up when I serve this for dinner so the effort isn’t worth the trouble. I’d much rather turn the marrows into something they will eat. This year I have made chocolate cakes, banana cakes, and apple cakes with grated zucchini. I have made pickle, chutney and sauce. I didn’t bother making zucchini marmalade again this year as it wasn’t a success with the family although I have finally used up the supply I made a few years ago – it is great when making sticky chicky (a super easy dish whereby a jar of marmalade and some sauce is added to chicken drums then baked in the oven until fragrant and gooey. Yum. Maybe I should make some zucchini marmalade just for Sticky Chicky). One year I got into the habit of making homemade sausage rolls. These are really very easy and much tastier than store-bought. I was reminded again of sausage rolls when I spotted some at our supermarket – they had an interesting flavour of Garlic & something, and Sun-dried tomato. We tried the garlic ones – while they tasted quite nice I couldn’t detect the garlic. 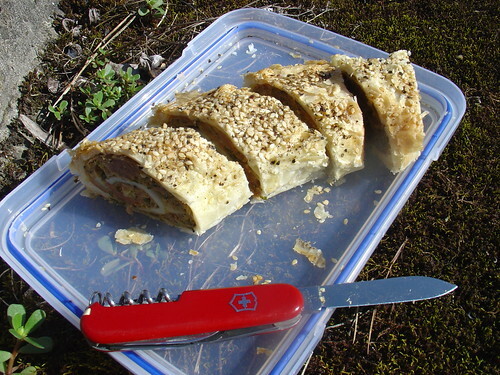 I feel the need to get creating in the kitchen again…… perhaps some Pork& Apple Sausage Rolls (Scrolls). 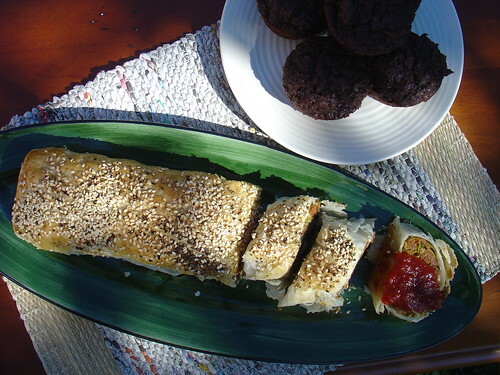 Rolls are small finger sized rolls while scrolls are one large scroll – almost knife and fork material. We took some scrolls on a day walk and they provided some much-needed nourishment after a day walking up hills, through streams and bush-crashing our way down a neglected track. Note: Make sure you use really good beef sausages and not beef-flavoured sausages. Slit sausage skins open down the length of the sausage with kitchen scissors and peel the skins away from the meat. Place sausage meat into a bowl and give the skins to the cat. Place grated zucchini in a clean tea towel and wring out as much moisture as possible. Add drained zucchini, egg, spring onions, garlic, breadcrumbs, parsley, chives, salt and pepper. Mix until well combined. Divide the sausage mix into thirds and spread out over each pastry sheet, leaving a 2 cm edge free along one edge. Brush the pastry edge with lightly beaten egg. Loosely roll up pastry towards the clear edge to create a sausage swiss roll shape, pressing gently to close off the scroll. Place each whole sausage log seam side down on a lightly greased oven tray. Brush liberally with remaining beaten egg then sprinkle with sesame seeds and cracked black pepper. Bake the sausage log in a preheated oven 180ºC for 35-40 minutes or until the pastry is puffed and golden. Serve sliced into 2 cm chunks with tomato chutney. 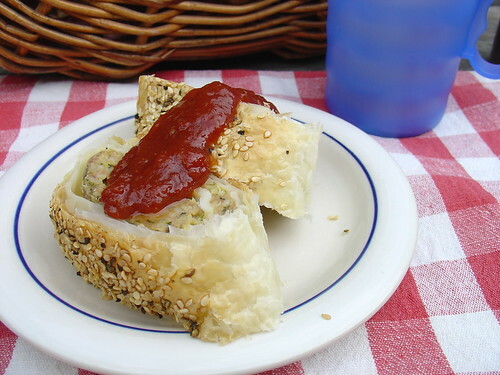 These sausage scrolls are equally good hot or cold. This entry was posted in Autumn, Baking, Savour, Savoury and tagged courgettes, sausage rolls, sausage scrolls, zucchini by Jo Dohrman. Bookmark the permalink.